Condition: Excellent for age. Even lowish pile. Notes: One of my very finest pieces. 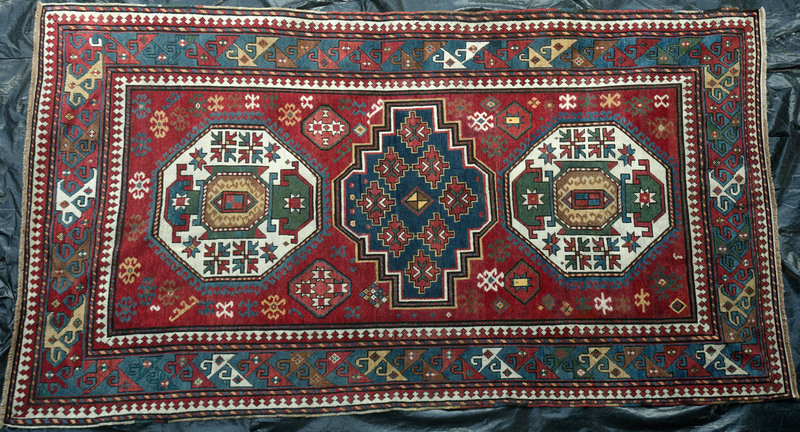 This is a hugely collectable antique Kazak of suberb design, drawing, weave and colour. This may not be cheap but don't mistake that for it not being good value. This is an investment piece that will also bring pleasure to you each and every time you look at it. This is most likely so called 'three medallion Kazak', but it bears so much resemblance to a Lori Pambak (nearby village & sharing many similarities) that it may be either. However it does lack the usual Lori Pambak central medallion emblem.